I think it looks great. I got the feeling that she was catching some air in this one, and having a blast doing so. The difficulty I have with the script is that I have to pre-animate and keyframe what I want blured and if I'm not smooth with that, then the resulting blur effect is off as well. Thanks, I'll probably try a second version where I lower the bike on it's render and see what the two look like compared to each other later today. Ok, I'm not the most expert with putting things together from different layers in postwork, so take this with a grain of salt. And maybe if ,as you say the floating was there before the move, the problem will be solved with two renders rendered with the bike grounded. Anyways what I meant with three renders: I would use the last render with everything in it as a measure to see where the bike should be touching ground, and when its done remove that layer altogether. Does that make sense now? 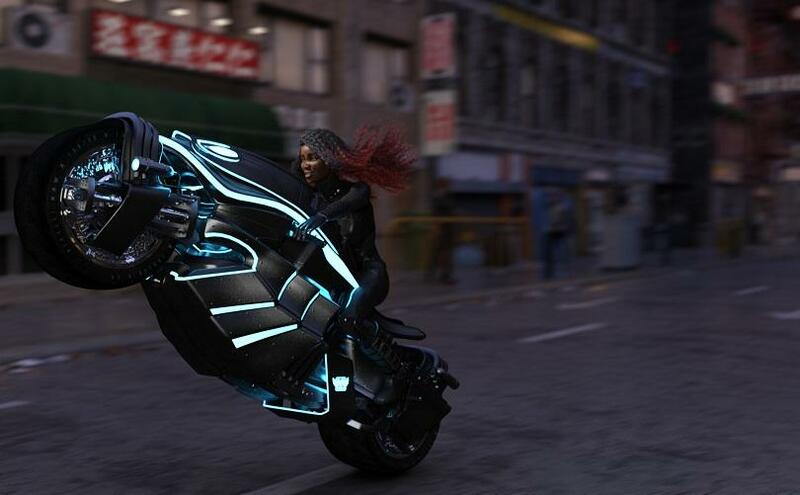 Another possibility I just remembered would be to render the bike (andr rider) with nothing but the ground activated in the environment settings, (plus the lights obviously) that way you will get a render of the bike with a shadow that is transparent, so you can lay the shadow on the street togthter with the bike. I'm not a whole lot of help on compositing or on motion blur, but for what it's worth, I agree with Shinji here - that little bit of lift looks exactly as if she was catching air, and emphasizes the movement. So, I'm very new, and have been busy with work but this render is my WIP version 2 of my first serious render. I attempted to consider composition and lighting here (aiming for a night scene) but as I'm sure most of you can tell, I certainly need to work on some basics. I know I need to re-pose the character... He's causing quite the splash for walking out of the water so nonchalantly. So I need to adjust him to a more 'leaping out' sort of pose, at the very least. After work I'll read up on some of the links in the OP, but would certainly appreciate any tips from users as well. Thanks all, as said earlier here's the second version, exact same background layer but with a new render of the character and the bike (and the shadow of it) on the top layer with the y axis lowered on the group for rendering. @linwelly: I think I understand what you mean now, but gotten away without needing it for this one I believe. Not sure which of the two I prefer, but I did want to try using the layers a second time as I've never done it before the previous picture. Was hit with this idea last night and let it run for 5 hours 34 minutes 57.35 seconds and 15000 iterations. I'll see if there's time this afternoon to make some tweeks to materials and the orc. Night scenes are not easy to light but you have done a nice job. Right now the flowers to the left of the image are drawing my eye. They are the brightest against dark elements in the image. Are you using Iray? Did you apply an emitter to the flowers? If you want the frogman to be the focus perhaps try to bring the glowing orb closer to his face when you play with his posing? This might bring the attention to that area and the focus to him. Right now the flowers to the left of the image are drawing my eye. They are the brightest against dark elements in the image. Are you using Iray? Did you apply an emitter to the flowers? Thanks for the welcome :) This is an iRay render, and I adjusted most surfaces in this scene to use iRay shaders. I don't recall messing with the petals on the flowers, though, but I do agree they detract from the scene. I don't know why they are so bright... I'll have to look into toning them down. Also, that's a fantastic suggestion about bringing the glowing rock closer to his face after re-pose to bring attention to him... Thanks very much for that!! I do appreciate your advice, tonight after work I'll begin implementing it, and begin the re-posing. Haven't had a chance to work on this since the weekend. Edit to add: the only emitter I created was on the glowing rock. It's a normal landscape rock prop that I adjusted to emit. That took some research to do, and as I type this at work away from my computer, I forgot what I did lol. The first thing I noticed was the female character's feet are cut off. The red light reflected on the surface of the gun is intersting. I find it is drawing my eye but then my eye jumps to her face. The red light and the ceiling light over the Orc's head draws my eye there and then to him. The glasses are a nice touch. I had a look at dform, and after finding some docs had a go. I don't think in this case this will work. Or I need to have a lot more experience using it! So I came to the conclusion that, as not everybody realized that it was a snowglobe, that I needed to do some work on the pose. I have now done this, and now I need to look at the base of the snowglobe. My current thinking is that if I modify the base of the snowglobe to match the material of the pillars then it will look like it was built like that. So far I have not been able to work out how to do that. I suspect I may have to port it to hexagon , but I'm not really sure. Here's version b of my latest idea. I would have posted sooner, but had trouble getting up and about, and when I did get myself up and moving I had to head to the store to get a few thing. 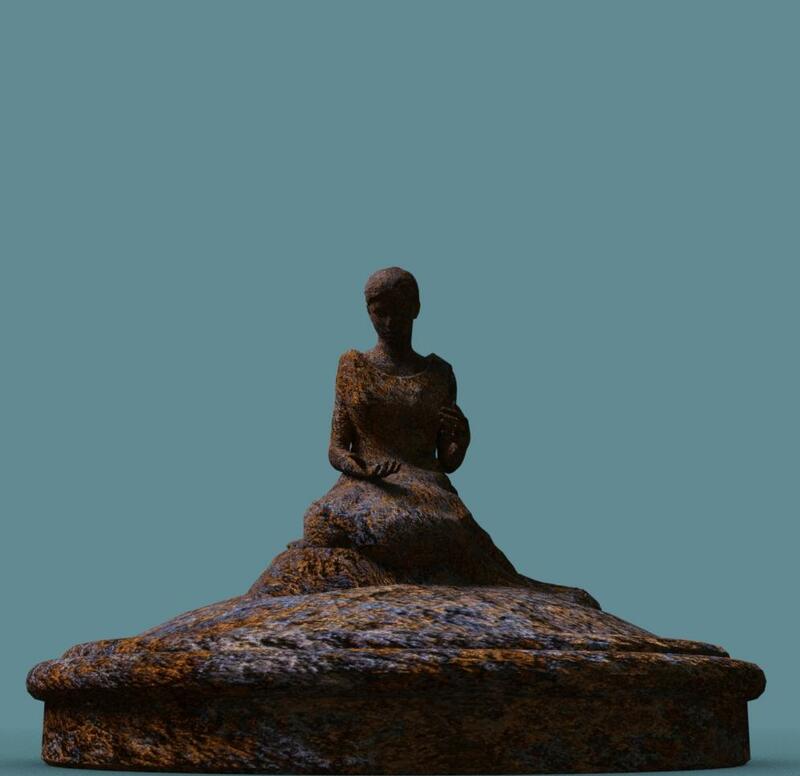 I started with a copper lid from a canister set and a stone statue from a different set. Obviously, the textures are very different, but I want them to look like they're carved from one stone piece. Click the Editor tab within the Surfaces tab. The down arrow will open each of the surface areas you can alter. Select the one you want to change. In my case, I want to change the entire thing, so I just selected the item. Switch to the Presets tab in the Surfaces tab. I nearly always start by applying the Iray Uber Base shader. 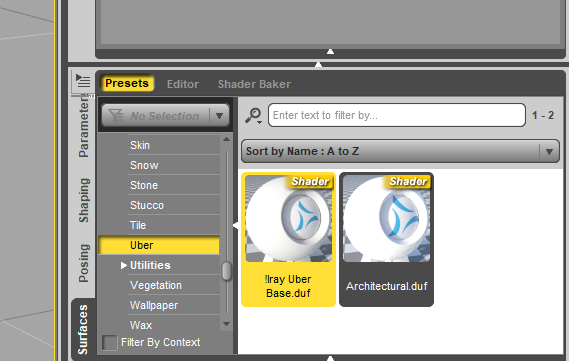 Find the shader you want to apply and double-click it to apply. Not sure how well that would work with what you want to do - you would lose patterns on the pillars, for example - but it might be something to try, and a whole lot easier than joining the models in Hexagon. Wow! Thanks for all the info and the screenshots. My problem is that you lost me almost from the start. I am aware of 'shaders', and I believe they are sophisticated and complex transformations, but have no idea of details beyond that. I am working from the newbie guide, which makes almost no mention of shaders. Finally, the snowglobe is all of one piece, so applying a change globally will change the glass as well - which is not quite what I want! But many thanks for taking the time to respond. When I know more about what I am doing it will probably make sense! @harrybroomhall - Last year's November New User Challenge involved Materials. There are some tutorials and information on Materials in the first post that might be helpful. How to make the sky look real? 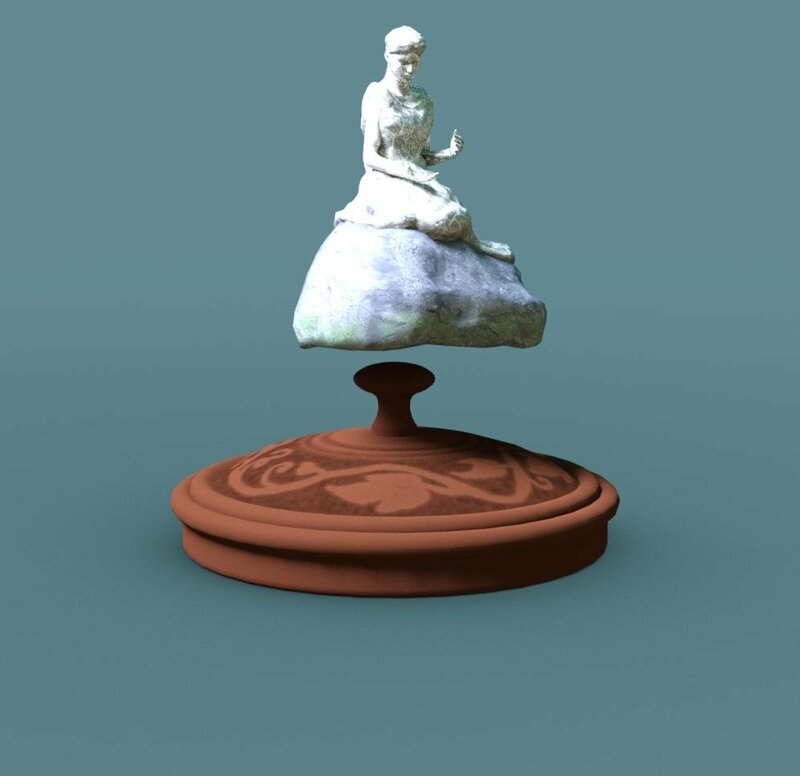 Image has come out a bit small to see anything there, but the easiest ways are either to set the background to a photograph of the sky, or in the render settings set Draw Dome to On and make sure you're using a HDR which has a reasonable sky. If you don't already have one you like you can find a number of ones that you can download for free, take a look through the Freebie forum and you should see some. Is there a tutorial on attaching larger pictures? what is large in your measurement? I know how you feel. That was and is one of my main problems too. People want help me and gave good advices, but they are sometimes to complex, or I have not the right background knowledge, to use them. Don't be worry. Some things, you will learn fast and some other make take a while until you see a tutorial or find out by yourself how things works. Until then just have fun and do the things you like. If something will not work, try something else. For the snowglobe.I don't know which style you use, but look in the top for the tab called Windows. Click on them, search the surface tab and click on it. Now a new tab should appear. As example I load a small chair. He's a object like your snowglobe.If you click him ( or your snowglobe) in your scene tab, he now apears in the surface tab. Here you can double click on him and most time a tree will apear (even at objects) where you can see the different surfaces of the prop. In the left uper corner of the Surface tab you can also see what type of shader it is. Most you will see Daz Default or Iray, but there are a few other typs. To change shaders it's important to choose the object (or the area you want on the object---in my example the seat and the backrest) in the scene tab and EVEN in the surface tab. 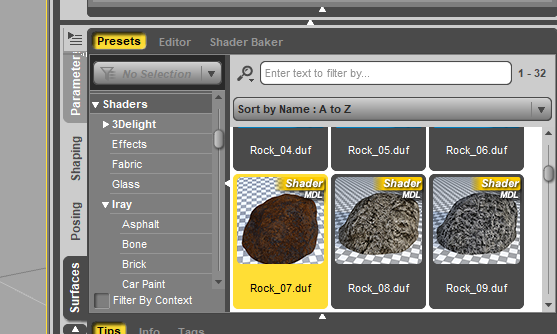 Click on your content library and tipe Shaders in the search tab above. Now they should apear different symbols and things like Shader/materials/script. Materials are designed for a special prop and work only with them. Scripts and shaders can be used on nearly everything. When you move your mouse over a shader and don't move her for awhile, a hint appears and mostly you can see if the shader is default or iray. If you use iray it's important to use iray shader. 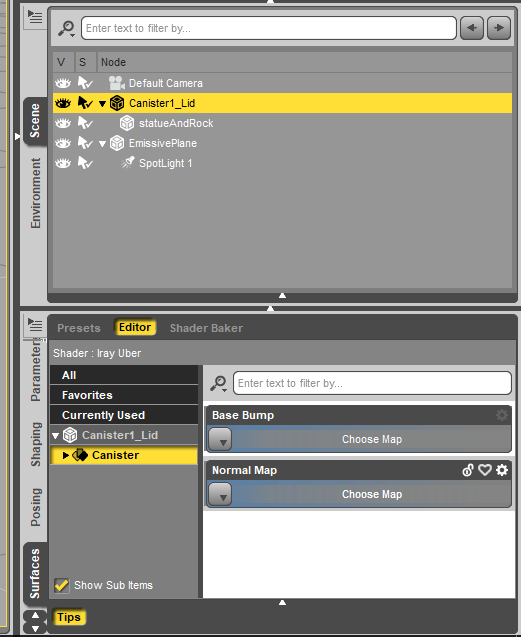 If you now have chosen the area you want change in the SCENE AND SURFACE tab, double click on the shader. The chair looks now so. Yeah, we did it, but there is one big mistake! The shader has overwriten all the entrys in the surface tab. Even those we want keep, like the base color and the base map. To avoid this, hold the left strg or ctrl button before you klick on the shader. Now a new window should apear (still hold the strg or ctrl button)where you can choose ignore under images. Well, that was much bla bla, but I hope it will help you a little. So, for me it will be the last entry this month. I know that there are many things that can be improven, but it took me so many time to make a render, that I have no time for another try. I'm happy to get the puddles to work. They may not look very realistic, but for a first try I find it very nice. Thank you *very* much for all of that! Absolutely wonderful! I have tried experimenting on the snowglobe and it looks as if I don't need to go via Hexagon. It will take some time getting the hang of it though. So far my main problem is how to get the 'Alcove' pattern to be offered as a shader. So, for me it will be the last entry this month. 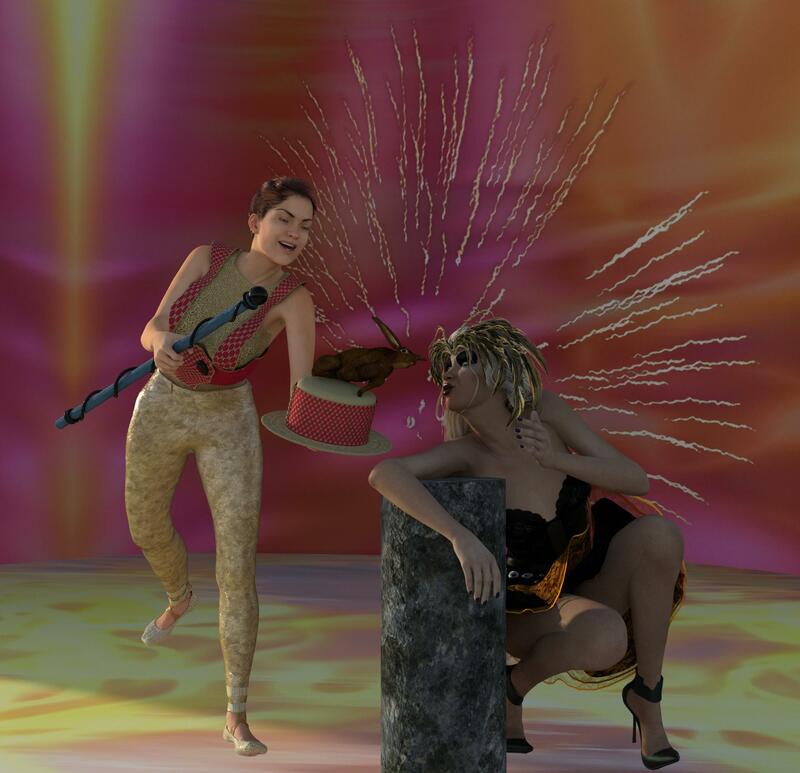 I know that thera are many things that can be improven, but it took me so many time to make a render, that I have no time for another try. The puddles look great - and good on you for going that route! I still like the (now missing) little girl in the foreground, but this looks pretty darn good!